As I explore more the power of live streaming apps like Meerkat and Periscope, I find myself wondering how this might affect classroom teaching. I don’t see a direct use for the tools in my everyday teaching. I’d rather record a presentation that my students can then playback as many times as they need. I’m also someone who much prefers asynchronous communication for online learning – so that students can approach the learning on their own time, but also so that students have time to think about their responses before they give them. When using the live streaming apps, I was immediately creeped out by how easy it was to start live streaming from my phone. It just seemed too easy to self-broadcast. I’ve played with the apps a little more, so I’m a bit more used to it. It is amazing how quickly a new technology can go from creepy to normal. The one area that I’m not seeing a lot of discussion is around the impact live streaming might have on the privacy of the people being streamed. It is easy enough to control the data that you stream (once you understand what your phone shares), but there is no way to protect against others streaming you. 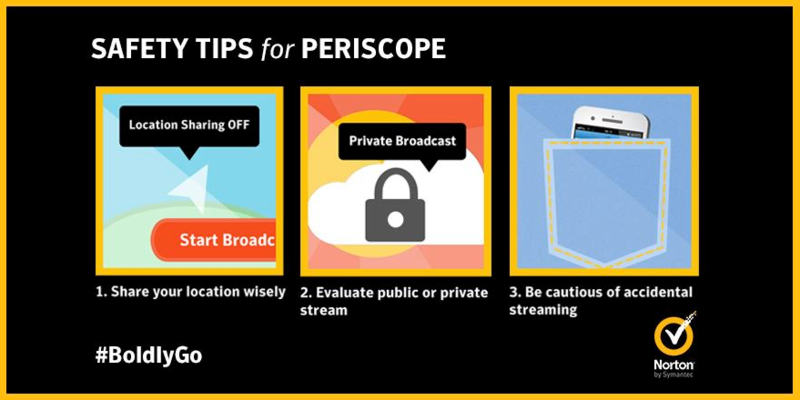 Anytime you walk into a public (or even semi-public) space, there is a risk that you may be live streamed. Next, what do we think about this technology and the classroom? I encourage my students (in-service teachers) to integrate mobile technologies into their classroom where appropriate. As a teacher, you may come to expect that your students may live stream you on the internet. But as a student, you will not expect that your classmates may live stream you. What does that do for creating a safe learning environment? In some ways, this technology is no different than technology we have had before. We’ve been able to video anyone and upload that video to YouTube for years. Why does this technology feel so much more invasive?